Structural Correction chiropractic care is unique in its approach to the spine and health. We choose to approach the spine systematically and purposefully in order to correct spinal misalignment (subluxations) and correct the damaging and destructive effects they have on the spine and on the body. About 90% of our clients are seeking better health (not just trying to relieve a secondary condition such as pain). Our unique approach to the spine, and to health, is based on restoring a normal alignment to the spine, resulting in a normal relationship between the nerve system, and the body. The spine affects our nerve system directly so alignment issues of the spine affect nerve flow. Nerve flow is how the brain controls the body. A strong brain – body connection, meaning good nerve flow between the brain and body, produces good function of the body. That is health. 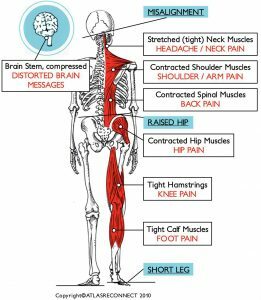 A poor nerve flow between the brain and body, because of a spinal misalignment / subluxation, produces poor function of the body. Chronic poor nerve flow = poor health leading to dis-ease and disease. We believe that through the application of corrective chiropractic adjustments, we can have a positive affect on the alignment of the spine. This correction restores the nerve flow between the brain and body, resulting in better nerve flow and health, as the body begins to work more normally.